Easy baked Gluten Free Chicken Tenders! 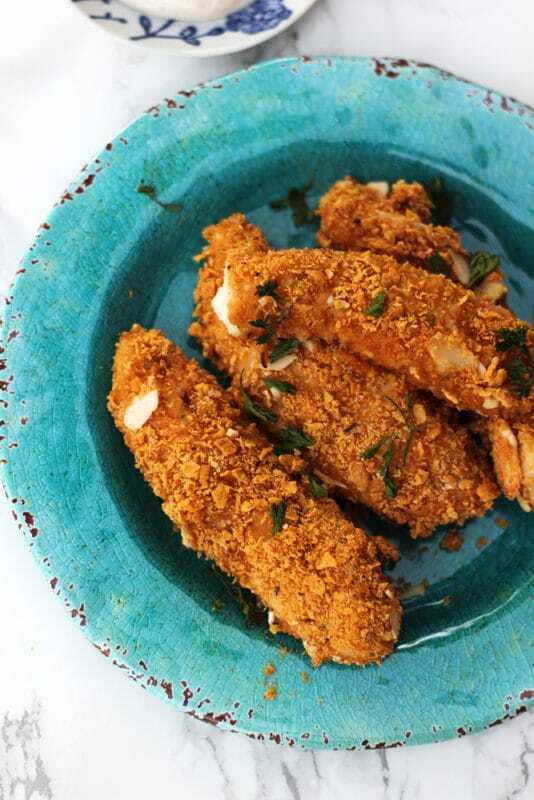 Crispy and delicious, these chicken tenders are healthy, quick to prep and easy to make! This is a sponsored post written by me on behalf of Zaycon Fresh. All opinions are entirely my own. But what if I gave you a healthier version you can make at home? Would you eat more chicken tenders? YES! You totally would because they are healthier and they are gluten free! Let me elaborate a little bit for you. First, let’s talk chicken. I don’t know about you but I get sick and tired of buying these HUGE chicken breasts that turn out to be rubbery and chewy after I cook them. My friend told me if I wanted good chicken, I should check out Zaycon Fresh. If you don’t know how Zaycon Fresh works, this Good Morning America clip explains it all! When my friend introduced me to Zaycon Fresh, she informed me that they use only farm direct foods. Typically, that means the meat product is super fresh. Then she shared how Zaycon Fresh delivers right to your car. So we’re talking fresh AND convenient…yep I was all over this idea! So I went to their website here to find a close delivery location based on where I live and I signed up for my delivery. We eat a lot of chicken at Mason Manor and since I was ordering by the case, I decided to stock up on Chicken Breast Tenderloins. And guys, this chicken is SO tender! There is no sign of rubbery texture with this chicken! Let’s talk about Gluten Free for a minute. Yes, the chickpea flour is Gluten Free, but not all Corn Flakes are Gluten Free. Kellogg’s Corn Flakes contain a barley malt sweetener which contains gluten so stay away from that brand. If you’re looking for some good Gluten Free Cornflakes check these out. For what it’s worth, Nature’s Path Corn Flakes are my absolute favorite! This is a great article to give you some details about which Corn Flakes are Gluten Free: Which Brands of Corn Flakes Are Gluten Free? Now, let’s talk chicken tenders for a minute. My kids LOVE chicken tenders and ask for them often. Because of this I decided to come up with my own recipe for Gluten Free Chicken Tenders so I could enjoy one of my favorite foods with my kiddos! As you know, most chicken tenders are breaded…and so is my version. But I use chickpea flour as the bread base. And…it’s 100% gluten free! Just so you know…chickpea flour is the same as garbanzo bean flour and sometimes it’s called Besan flour. That’s your food lesson for the day! You’re welcome. Have you ever cooked with chickpea flour? If not, you are missing out! This is the BEST flour to produce that crispy texture! Just take a look at how it coats and turned out for these Onion Bhajis! 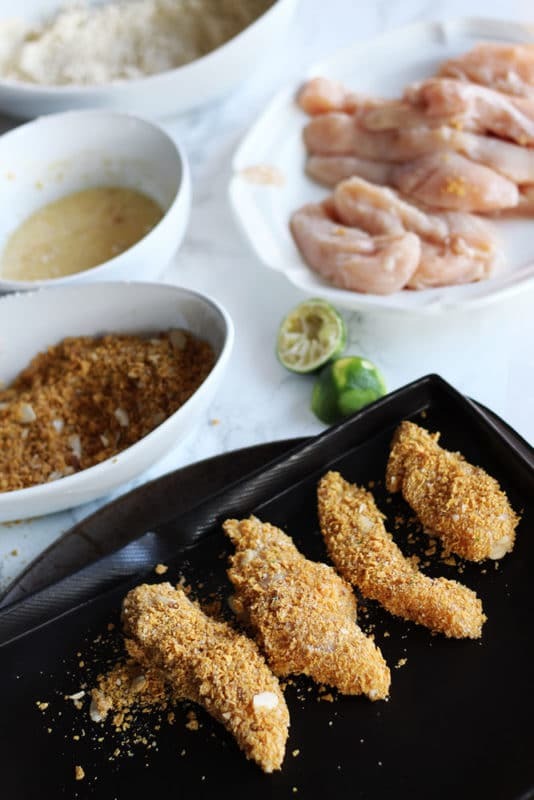 So here’s how I make this fabulous chicken tenders recipe. I take 4 cups of corn flakes and put them in a large Ziplock bag. From there, I roll my rolling pin over the bag until I crush them into crumbs…kinda like breadcrumbs! Then, I add in some of my favorite seasonings to the corn flake breadcrumb mixture such as garlic powder, smoked paprika, seasoning salt, Parmesan cheese and almond slices! I also add fresh lime zest in this step. I mix the seasonings together with the corn flakes and stir well until everything is well combined. The next step is to take fresh lime juice and whisk it with two eggs. 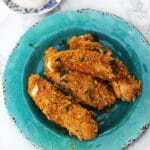 The addition of the lime juice really makes the flavor “pop” in these chicken tenders! You’ll want to ensure the mixture is well mixed because you’re going to use the egg batter to help those corn flake crumbs stick to the chicken! Now we are ready to start breading the chicken tenders! You’ll place your chickpea flour in a bowl and then grab a chicken tender. Roll that chicken tender in the flour until it’s well coated. Then, you’ll dip the chicken tender in the egg and lime juice mixture. Your chicken tender will now be wet. You’ll then roll the egg coated chicken tender in the corn flake crumb mixture and then place them on a cookie sheet. I used a flexipan to cook my chicken tenders…read more about my love of the flexipan here. You’re going to bake these chicken tenders in the oven for about 30 minutes. They will turn a golden brown color and become oh so crispy when they bake! I top these chicken tenders off with fresh parsley and dip them in either ranch or ketchup (or both)! Now, how easy peasy is that my friends?! This recipe is so simple and the taste of these chicken tenders are just incredible! And hey, since we are talking about AMAZING chicken recipes, check out the most popular chicken recipes on my food blog: Lemon Butter Chicken, Baked Chicken with Dijon Lime Sauce and Greek Marinated Chicken! Everyone can enjoy these chicken tenders and they are a family favorite! And keep in mind…life is super busy. Take shortcuts where you can to buy in bulk and save yourself time and money. 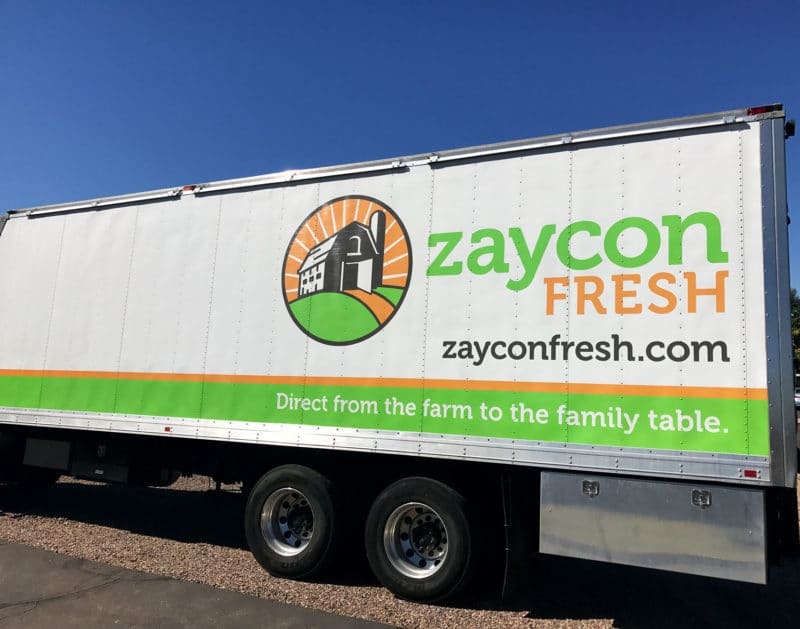 I’m SO glad my friend told me about Zaycon Fresh! They have a large variety of meat choices and their product quality and convenient service really makes my busy and hectic schedule a little less burdensome! So there you have it! Happy Eats, my friends! Easy baked Gluten Free Chicken Tenders! 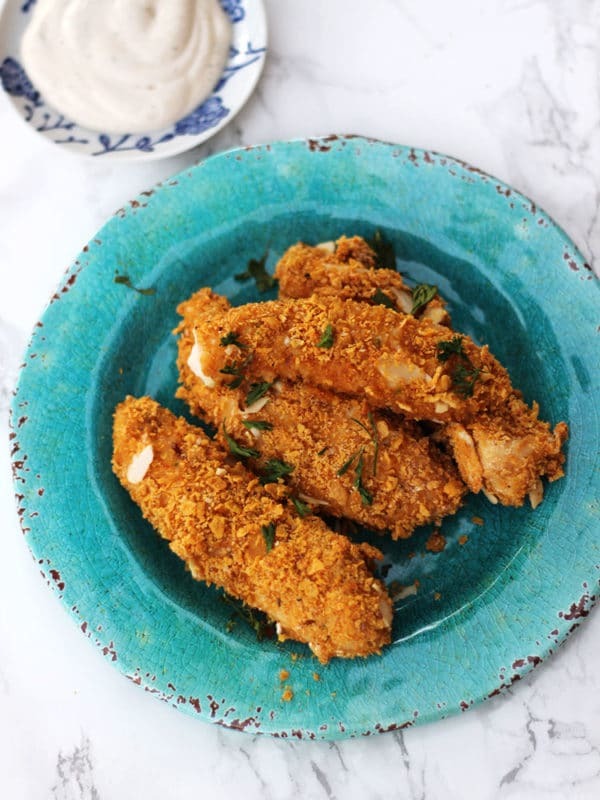 Crispy and delicious, these chicken tenders are healthy quick to prep, easy to make and hey...they passed the kid taste test! Preheat oven to 350 degrees Fahrenheit. 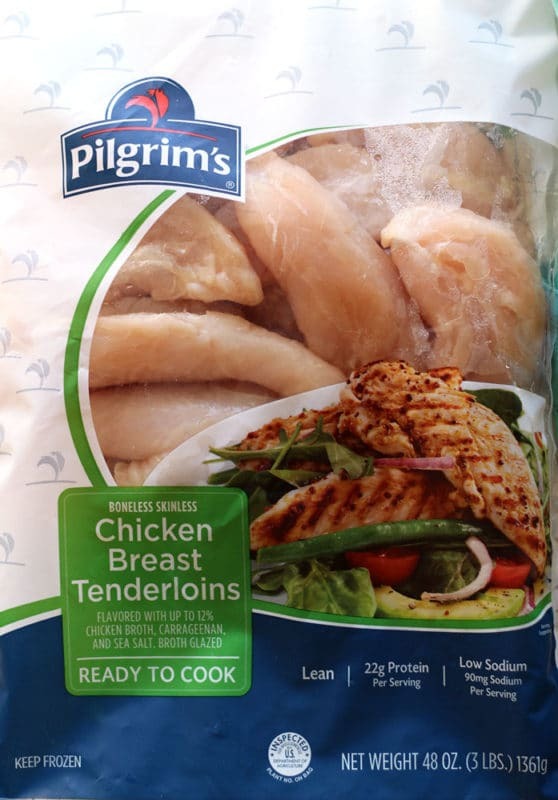 Rinse thawed chicken tenderloins well and set aside. Pour 1 cup of chickpea flour in a shallow dish and set aside. Take 4 cups of corn flakes and put in a gallon sized Ziplock bag. 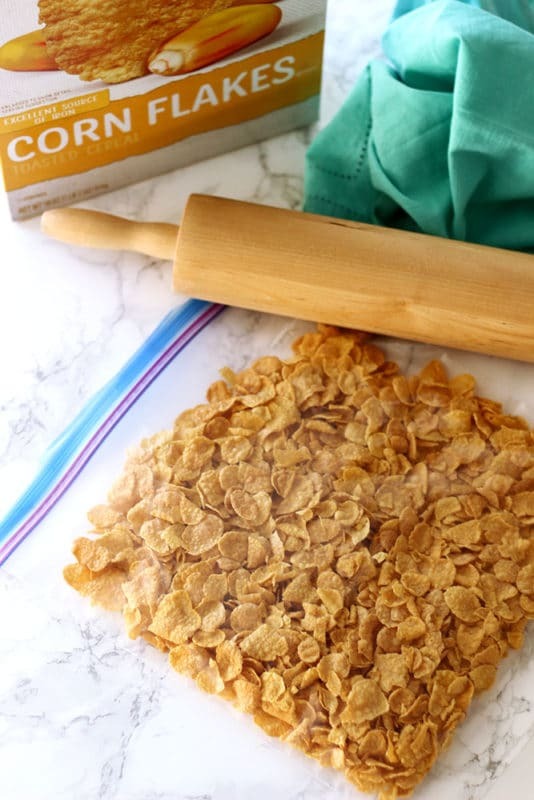 Take a rolling pin and crush the corn flakes until they are in the form of breadcrumbs. Pour the corn flake crumbs into a shallow bowl. 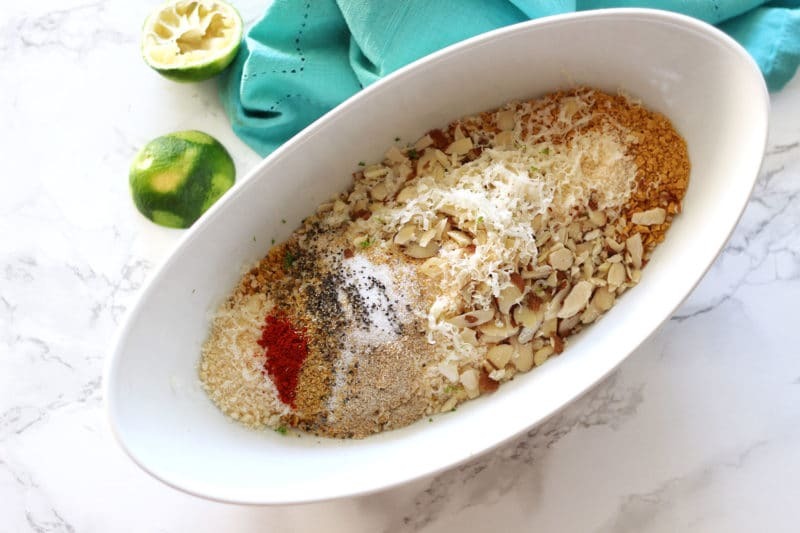 Add in the garlic powder, salt, almonds, Parmesan cheese, seasoning salt, paprika, lime zest and ground pepper and mix well with the corn flake crumbs. Set aside. 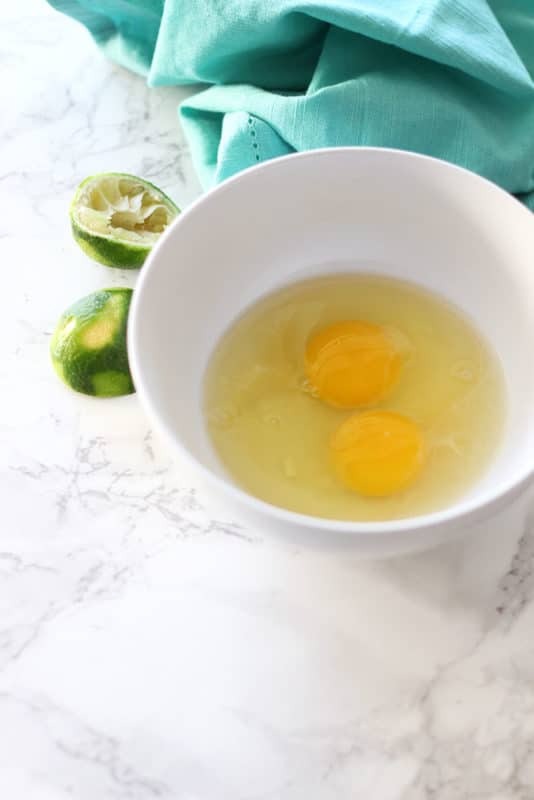 In a separate shallow bowl, add the 2 eggs, lime juice and 2 Tablespoons of water. Whisk well until all ingredients are well combined. You are now ready to bread the chicken tenders! Take a chicken tender and roll it in the chickpea flour until it's well coated. Then, take the chicken tender and dip it into the egg mixture. Roll the chicken tender in the corn flake crumble mixture until it's well coated. Place chicken tender on a cookie sheet and repeat steps 6-8 until all the chicken tenderloins are coated. Place cookie sheet in the oven and bake for 30 minutes until done. The tenders should be a golden color and crispy! You may have some chickpea flour left over. Do not save any leftover flour since raw chicken was used to coat the chicken tenders. Toss any excess chickpea flour. I like to line my cookie sheet with aluminum foil when baking to avoid the mixture sticking to the cooking sheet. I sometimes rub extra virgin olive oil on the aluminum foil before placing the chicken tender on to bake. You can leave the sliced almonds as is or add in to be crushed when rolling the corn flakes, your preference here! Pin these GLUTEN FREE CHICKEN TENDERS to your favorite GLUTEN FREE and EASY DINNER boards on PINTEREST! Chicken nuggets are my grandson’s favourite and maybe I don’t always like the store-bought ones. Now I have a tried and tested recipe! Yes! He will love these! They are such a great family favorite here at Mason manor! !